There is a Manchester City v Chelsea match taking place next door at the Stadium with a 4.30pm kick off. There will be expected congestion in the area. Wembley park station will be very busy. When exiting Wembley park station please avoid Olympic Way and use Empire Way or exit left onto Bridge road. Where possible use Wembley Central. Brian is Professor of Particle Physics at The University of Manchester, The Royal Society Professor for Public Engagement in Science and a Fellow of the Royal Society. As a broadcaster, he has presented a number of highly acclaimed science programmes for the BBC, boosting the popularity of subjects such as astronomy and physics and garnering a host of accolades, including two Royal Television Society awards and a Peabody Award for Wonders Of The Solar System. He has also authored a series of best-selling books, including the widely acclaimed Human Universe and the recently released Universal: A Guide to the Cosmos, and is recognised as the foremost communicator for all things scientific. His critically acclaimed BBC series, Forces of Nature, aired in 2016 whilst he recently once again co-hosted Stargazing Live. 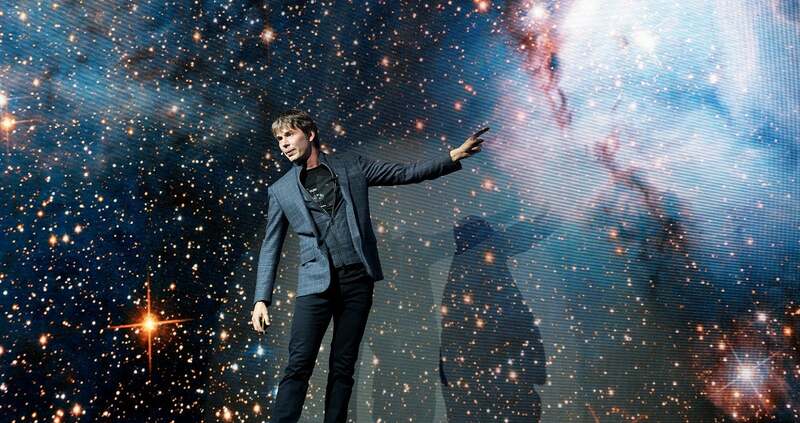 He holds two Guinness World Record titles for a science tour for his total sell-out debut tour, which began in 2016 and saw over 150,000 attend in total, including a sell-out show at The SSE Arena, Wembley.